Around 200 million Americans live within a day’s drive of the total eclipse path, the narrow band of territory from Oregon to South Carolina. According to an article in The Atlantic, up to 7 million people, perhaps even people reading this, will travel to see Monday’s total eclipse. They will join the 12 million who are lucky enough to see the total eclipse without needing to travel. If 7 million people do travel then it will be the biggest movement of people in human history to see a natural phenomenon. Even if the fear of being stuck in a traffic jam for many hours puts people off and a lower number of people actually make the journey, the growth of social media means that the number of people following the eclipse on-line in real time will be unprecedented. To mark this event I’ve decided to publish an updated version of my eclipse post from July 9. 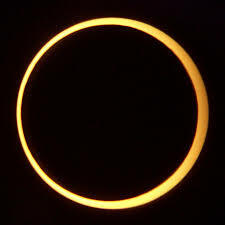 Although there is, on average, a total eclipse somewhere on Earth every 18 months, for each eclipse the region of on the world where a total eclipse can be seen is relatively small. 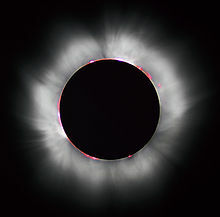 Unless you are a so-called eclipse chaser – people who travel long distance to see solar eclipses, you will probably only get a change to see a total eclipse within 1000 km of where you live once or twice in your lifetime. The last time that one has been visible anywhere in the contiguous US was back in February 1979, when most people currently alive weren’t even born (see note 1). 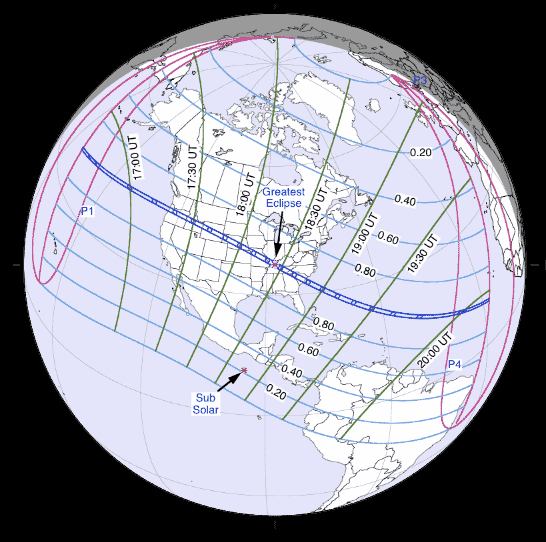 The path of totality, where a total eclipse can be seen is shown as the blue band in the map below. 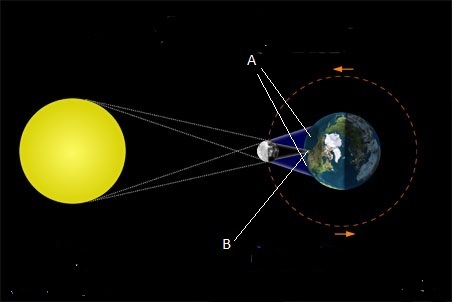 Places either side of the blue band will only see a partial eclipse, when the Sun is only partially obscured and the further away from it you are, the smaller the fraction of the Sun that will be covered. Unfortunately for people like me who live in the UK the eclipse will be barely noticeable, only a small fraction of the Sun will be obscured, just before sunset. The path of the eclipse as it moves across the US is shown below. If you click on the diagram it will show the map in greater detail. 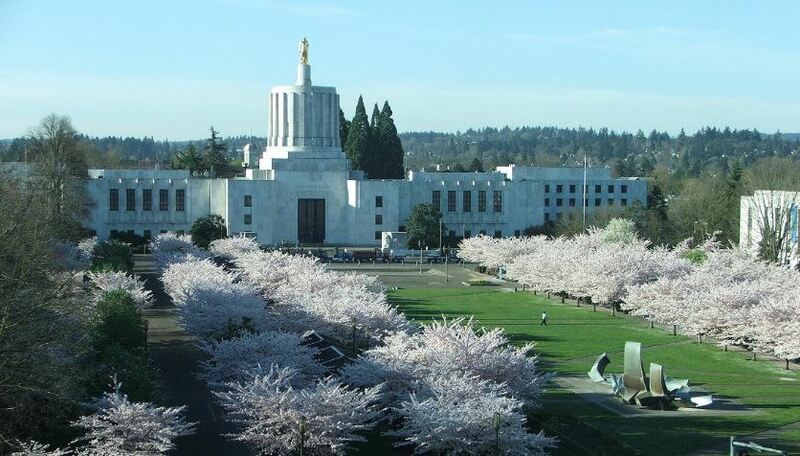 The total eclipse will begin over the Pacific Ocean and will reach the Pacific coast of America in Oregon just West of the state capital Salem (shown below) at 10:16 am local time. The table below shows the eclipse times from some selected cities in its path. This means that during most lunar months the Moon will pass just below or just above the Sun rather than obscuring it. There are only two time windows in a year when it is possible for a solar eclipse to occur (see note 2). It also only possible for a lunar eclipse, when the Earth blocks sunlight hitting the Moon, to occur in the same time window. I’m travelling! We’ve had our hotel reservations for months. Too bad we can’t put in reservations for a cloudless sky. I hope you have had good journey and if you’re driving you don’t get stuck in a traffic jam. France, August 1st 1999, wonderful experience, rather spooky at the onset of dusk and silence. Sorry I won’t get to see it. Me too. I’ll have to look out for the next one closer to home.